The picture above tells a lot for a number of reasons. So much, in fact, that it should determine not only a great deal regarding the success of the Cardinals’ defense, but the success of the team as a whole. Let’s discuss some of the reasons why that picture is so telling. It’s a picture of the inside linebackers, an increasingly important position that, combined with CB and QB, comprises the most pivotal positions at training camp right now. Paris Lenon is in it. Even if Hayes was healthy, Lenon (# 51) would still be “in the picture,” but in a much different capacity. Instead of a placeholder for the future, Lenon is number one on the depth chart, a position for which he is not suitable. Reggie Walker has a legitimate shot to start. 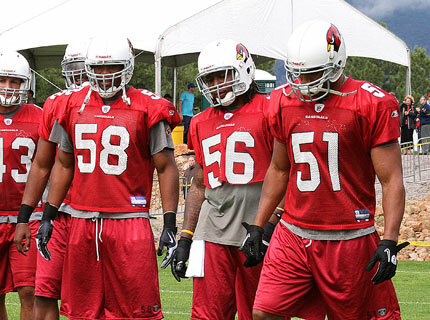 Walker (# 56) is entering his second season in the NFL after playing at Kansas State. He appeared in seven games for the Cards last season compiling six tackles. Not to slight Walker, but the fact that he has a legitimate chance to start the season is a bleak commentary on the Cardinals’ linebacker situation. Walker wasn’t a highly touted prospect and hasn’t shown a great deal of promise thus far. Ali Highsmith (not pictured) is currently number two on the depth chart behind Paris Lenon, but Walker could very well overtake Highsmith. Daryl Washington has a lot of work to do. Washington (#58) has a lot of pressure on his shoulders to develop quickly. Whether Whisenhunt and the coaching staff would like to admit it, they desperately need Washington to be the player they believe he is. 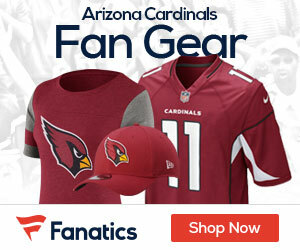 In fact, the Cardinals were planning to take Washington in the first round if Williams did not fall to them at the 26th pick. In addition, the Cards had Washington rated higher than inside linebacker Rolando McClain, who was picked eighth overall by Oakland. Having said that, Washington is currently third on the depth chart, which means he has a lot of work to do to prove himself. Washington believes he’s up to the task and believes he’s going to play sooner rather than later. “I think about [playing early in my career] a lot,” Washington said. “Playing early in your career is a great thing. There is a lot to learn. But to come in and play right way, those are my expectations.” As the heir apparent to Dansby’s position, the Cardinals would like nothing more than for Washington to force himself into the defense as quickly as possible. 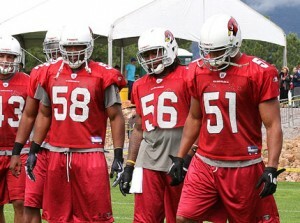 There’s still a chance that this picture could be altered by the Cardinals adding a veteran linebacker to the roster. As of now, however, it doesn’t appear that is likely to happen, which means what you see is likely what you’re going to get.